An important but often overlooked way that people working in graphics-related fields can evaluate the suitability of a monitor for color-critical work is if it has independent third-party certification. We will take a look at three internationally-recognized certifications – TUV Rheinland Color Accuracy, FograCert Softproof Monitor, and Idealliance Soft Proofing Display & System. 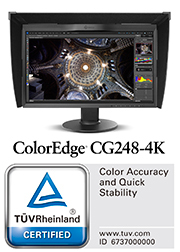 TUV Rheinland Color Accuracy measures the quality of the color reproduction of a monitor for use in printing, professional photography, design, and post production. EIZO was the first manufacturer to obtain this certification. FograCert Softproof Monitor was developed by Fogra, the German graphic arts research association. A FograCert Softproof Monitor is part of a FograCert Softproofing System that specifies requirements for a complete softproofing system for achieving a high-quality visual match between a monitor and a printed reference. 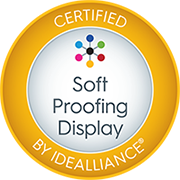 Idealliance's Soft Proofing Display & System Certification tests whether a monitor's image accurately simulates the appearance of a hard copy proof calibrated to a specific reference point. EIZO was the first manufacturer to obtain this updated certification. 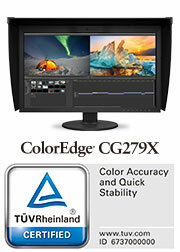 The following EIZO ColorEdge color management monitors have been obtained one or more of these certifications. 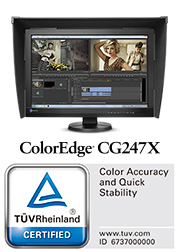 The requirements of these certifications and how the above ColorEdge CG monitors fulfill them are as follows. Viewing cone characteristics are evaluated by hue, chroma, lightness, and gradation (gamma stability) properties. • Minimal Delta-E deviation between display of sRGB and Adobe preset modes and sRGB and Adobe ICC profiles. 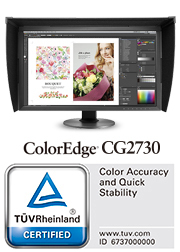 • High-precision calibration using the bundled ColorNavigator color management software ensures accurate color display. 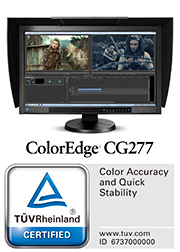 • Most ColorEdge CG Series monitors take just three minutes for the brightness, color, and grayscale characteristics to stabilize.The CG277 requires just seven minutes. • EIZO’s patented Digital Uniformity Equalizer technology counterbalances fluctuations in brightness and chroma across the screen. • IPS panel minimizes color shift when viewed from an angle. 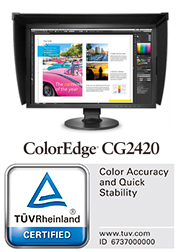 By using a monitor certified for color accuracy and soft proofing, creatives can trust that they are working with accurate, stable, and uniform color display. Interview with Junro Yonemitsu, manager of R&D, Visual Products (Application)　EIZO Corporation, about obtaining Color Accuracy certification.